Heyhey! 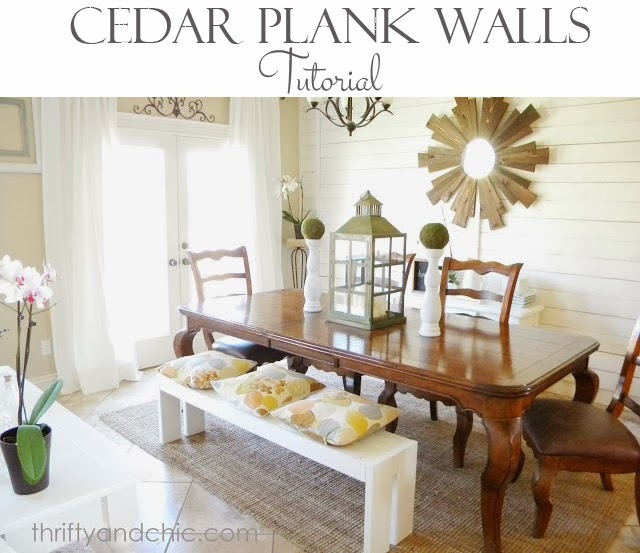 Today I'm going to prove to you my obsession with cedar planks :) ...in case you didn't know I had one. To start off. I'm been on this crazy mission to somewhat 'de-new' our house. It hasn't been real successful. When we were looking to purchase a house, I wanted old. I love the character of older houses. I love everything about older houses. My husband is exactly opposite. So, that didn't work well in my favor especially because where we were looking, the 'oldest' houses were maybe built in the mid nineties. Didn't bode well for me. I figured, as long as there were projects to do in the house, I guess I would be happy. Like redoing the kitchen and bathrooms, tearing down walls, etc etc. Well, every house we looked at, just didn't 'feel' right..... ya' know what I mean? We just didn't get 'that' feeling. We were actually about to give up, when we decided to do a last ditch effort, and look at the 'probably not, maybe if we have to...umm, actually, lets not even consider these' pile. In the picture, one of those houses was decent on the inside although it had weird alcoves, but on the outside, three front doors. Yes. French doors and then ten feet away, another front door. Odd? Yes. That's why we didn't even consider it. But, in our last ditch effort, we decided to go look at it. And am I ever so glad we did. It was beautiful! It was totally us. I finally got 'that' feeling. The only thing missing? There was nothing to change. Not a thing. Luckily, it had character in the arches and thick molding, so I was convinced to buy the house circa 2007 instead of circa 1940. So, throughout the years, I've added character through decor and decided to live with the rest of it. Because, in actuality I really did love it. But I still had those big blank problem walls that I never knew what to do with. That brings me to my next project :) Cedar planked walls. Remember this cedar planked table? I loved it. Absolutely adored it. But it was getting to a point where the hubs wasn't digging it anymore...and really, I would freak out with crazy anxiety every time someone came over cuz if anything was spilled, it would totally seep through the cracks, and get crazy nasty underneath the top, then I would have to take off all the legs and table top in front of the guests....not a good 'dinner party' if you ask me. Anyway. So, we decided to take it off. I didn't know where to put it so I just leaned it up against the wall....and what I saw, I really started liking. Like...a lot. Didn't look so awesome. Like, it was one of the projects where I ignored looking at. haha. That's when you know its bad :) It just looked really half hazard, gappy....and just not good. Not way bad, but definitely nothing that I wanted to live with. And now with a little more character :) And with the cedar planks positioned a little better. Okay. So, the first attempt on the wall was really not put up well. I maybe used 8 screws on the whole wall. I was trying to keep the hubs feelings in mind when putting it up (you know, his complete fear of having holes in the wall thing. ), thats why it ended up looking a little shotty :) I knew on this next attempt, I wanted to make it right. So. I wanted to work from the middle of the wall out. So, I found the middle. Then screwed in some wood on the closest studs. Then skipped one stud, and screwed some wood to the next stud. Luckily I had most of the cedar planks already painted from before, all I had to do was demolish them from eachother which took the longest time. But when I was done, I had a ton of planks to start putting up :) I started on one side, attaching the planks with my nail gun to each piece of wood. Then did the top of the next. Then screwed more wood to the studs, and continued to the bottom. Towards the end, I had to use some new planks. But luckily I had most of them on hand. Then I ran into these. Ugh. But! Nothing a jigsaw wouldn't fix :) I simply measured out the size, cuz it out with a jigsaw, and then put the plank back on. My measurement was a little off on this one, but once it was painted white, you barely notice. For the sides, I attached more wood to the stud, and then cut out the exact size I needed to fit the gap. I then nailed those in. And no, I usually don't get dressed up to use my nail gun :) I just got home from work and couldn't wait to finish the wall. I ended up going with this layout because I didn't want all the already painted wood to go to waste, even though it was too small. I wanted to use what I already had and not have to buy much more, so I took the 2 foot pieces and cut them to 10.5 inches each. I laid out multiple configurations, and decided this was the best way. It measures, 10.5 inches, 6 feet, 6 feet, 10.5 inches. At each seam, I attached a 1x2. And where the wood met the side wall, I also attached a 1x2. I absolutely love how this ended up looking. It makes the wall seem so much longer! Although, I'm not completely enamored with the decor right now. I'm thinking of two big round mirrors or maybe a little picture gallery. I'm not sure. The room is now a lot brighter too and the planked wall added the perfect amount of character. I really do miss the cedar planked table though. Although, the hubs did give me the go ahead to build a totally new table :) Can I just say how beyond excited I am about it ?? I guess there's still the issue that I really like this table and don't want to give it away, cuz if I make a new table, there's no place to put this table; it doesn't fit in any of our storage places :( Talk about conflicting feelings. Well, at least I have the cedar on the walls and anxiety out of my stomach when we have company over. This took about 40 or so cedar planks. Which cost a little bit more than I would want :) Although a third of them came from the table, so that cost was already sunk :) This cost about $40 or so dollars for the new planks. Any more ideas for adding character to your home? Updated: Here it is with my updated decor. Love it!! Wowwwweeeee!!! That is completely beautiful!! What a transformation!!! I love it!! Would you be able to paint your table?? It has gorgeous curves and would be lovely painted!! I am in love with your cedar walls! I so want to try this in my house to hide some of our old ugly walls in our 1970's ranch. Great job! Wow it looks beautiful! You're so pretty too :) Nice job, I love the character it adds to the room. So pretty! I love the planked walls :) It definitely adds charm! I so love this look!!! Just beautiful! um yes, nice to see what planks can do....gives me ideas for this house too. I agree that your table has a beautiful structure, maybe just needs a nice shabby paint job with the chairs too, and some beautiful decor on top with more greens, maybe some linen tablecloth or runners and I think it would be quite dramatic! Very nicely done! I think your husband and mine have the same opinions on houses, darn it! Oh my goodness....I LOVE the wall (and the whole room)! I would love it if you would link up at my linky party going on now! Can't wait to see you there! Gosh it's just BEAUTIFUL!!! It adds so much character! We've got a new construction home, which i was totally jazzed about at first, but now, it's sunk in that it's just so BLAH. No character. I want to find a way to use this in my house, just beautiful! I big high five for you Alicia! Those planks turned out very very very nice. Love your reveal picture so well set up just beautiful. Ummm- this may be the coolest thing I've ever seen. My husband would hate me if I wanted to do this (aaaandd I do) because he would pretty much have to do everything. I could barely hang curtains last week... they are up- but I did it totally wrong. Awesome job!! I really really really love your planked walls! 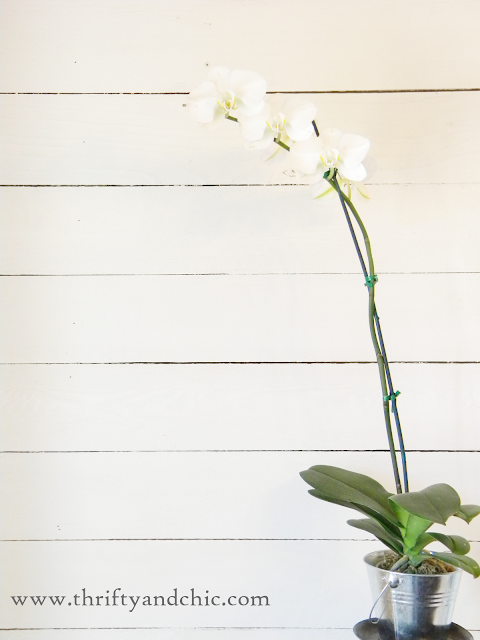 They look so cottagey and add some great texture to that long bare wall! Oh I absolutely love this! I would never have had the nerve, much less the idea. Great job! This is just stunning! I would love to do something like this in our house but I can hear the hubby now...LOL same thing with the holes in the wall and all! They just don't get it do they? Found you through Every Creative Endeavor and I LOVE THIS!! And can I just say that I SO relate to the husband who's afraid of holes in the wall?--gave me a good laugh :D New follower. This is gorgeous!! I have been wanting to do this in our master bedroom but I was so scared to try! Thank you for the inspiration! You have a new follower too!! Come visit sometime at simplystylishblog.com!! I love the painted cedar. I have cedar trim in my kitchen and family room and have been wanting to paint it but it's so rough I'm afraid that the paint will just get all sucked up--even with primer first. Any hints about how you made the paint cover. I hope it doesn't mean that I have to sand it all smooth first. Thanks. I need a push to paint this dark wood. love the look and the feel of the cedar wall, looks fantastic! Love what you've done! Great job :) Stop by for a visit sometime. The walls look great. As for the table? Why not just get glass cut to fit the table? A friend did this for hers and you can't even tell it's there. I understand about wanting an older home with character. We looked for many,many years for an historic home (like early 1900's). Never happened (for various reasons) but we did finally find a home with character built in 1961. Sometimes the wait is SO worth it! Anyway, your wall is beautiful, and from a girl who actually lives in the old bones, it's totally convincing! Good luck with making your home look and feel like you...that is one of life's greatest rewards in and of itself - it's the inherent difference between house and home. Welcome Home. You've done a fabulous job with your plank wall - and your dining room is gorgeous! Just my style too, nicely done! I have this linked to my plank walls post too today, for inspiration! I've fallen in love with your site...seriously, I mean that. Your style is so simple, clean, and classy! Thank you for sharing all these brilliant ideas! Well I am a convert to cedar plank now! Looks stunning! Thanks for your photos! I am thinking of doing this in the (ick) 1980's add-on to my 1930's house- I think it will really unify the rooms! FYI it's REALLY easy to move an outlet out an inch or two! It intimidated me when I did board and batten in a bathroom but ended up being a quick project that made a big difference! Love! Love! Love! It! I, too, want a pliant wall. I love it! Great inspiration for my big, boring living room! I've got to ask about the awesome mirror in the last photo - just what I'm looking for! I love the change you made here. Also how you solved the seam issue was perfect. I too plan on adding planks to our lundary room wall. You did an excellent job. I am in the same boat as you! I LOVE the character of old homes, but just barely bought a brand new home. I am trying to find ways to add character! I love your style! We will have to try doing this wall! What color did you use throughout your main floor?